I was blissfully walking on ice between Tilat Sumdo and Shingra Koma, admiring the high mountains and the contrast of the white snow. Suddenly, there was a catch on my back and a stabbing pain. The familiar pain was a message to slow down since I had felt it before during my trip to Kailash. I reclined on the nearest possible rock, wishing it away and waving at the trek mates to move on. As I looked up at the sky, immersed in its vastness, a soft voice and a kind touch brought me to back to reality. 2 pretty girls were inquiring if I was fine; The connection was instant with Tenzin and Tenzin !! 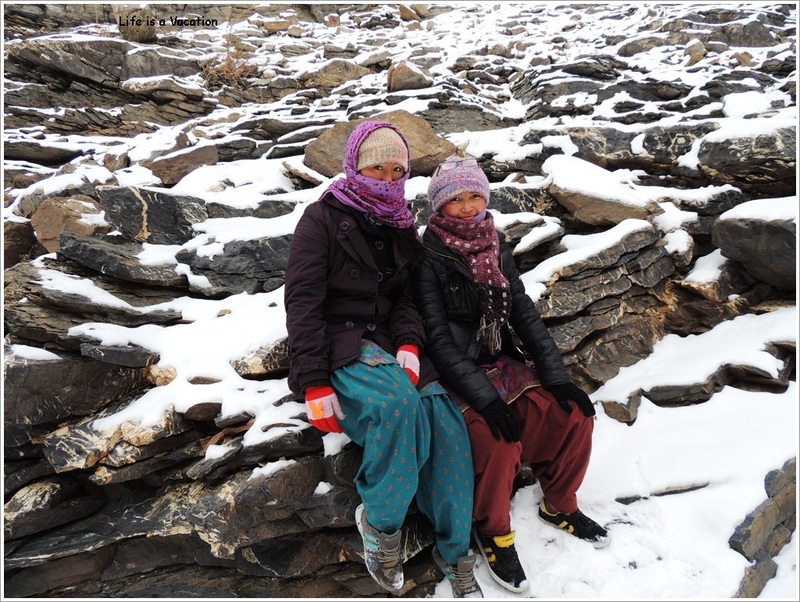 We rested on the rocks for a while listening to their story… They belong to the remote area of Zanskar in India which inherits the culture of Tibetan Buddhism. Due to heavy snowfall and cold, the national and internationally run schools in the area are unable to operate. The children of the area take a long winding route by bus through the motorable road which takes 2 days to reach Leh, the capital city of Ladakh for winter tuition. They were now returning home to Zanskar on foot through Chadar, the same way as we were trekking. What was an alternate world for us, was hard reality for them. They are hoping for the road from Leh-Chilling to Padum to complete so that they can reach home in a few hours. I join their prayers for the completion of the road too, there is light at the end of the tunnel for heartfelt sincere effort !! With Women’ s day round the corner, I only wish and bless Tenzin and Tenzin for a bright future ahead and bring glory to India with their sincerity and dedication. India has hope !! Sweet angels! Here’s hoping that the road is completed soon. Cal must have been much nicer then. Still we had a wonderful time.